Our time at Barrow Upon Soar is at an end.. the River Soar is open once more, and its time to move on. The last 4 weeks here (2 unplanned) have been interesting, whilst I do worry about mooring on a river with its ever changing levels, being between a lock and a wier has proven to be a good choice. There have been several times we needed to move the boat during the 4 weeks, once with the river levels near to their highest to get back to the water point to fill the water tank.. which was a squeeze getting under that bridge.. but all in all, the last 4 weeks have been uneventful thankfully. Yes the levels did change, almost 2 feet from when we arrived, to the height of the levels after the largest of the rains, but the levels have now dropped and we can move on with several of the boats that have been sharing the mooring here already moved off, as the river went green yesterday.. I also invested in a generator.. yes we have a fuel cell on board.. which is still there and perfect to keep the power going late into the evenings.. the gennie is for the washing machine, as I hate having to run and rev the engine to provide 100Amps@12v to get 1600W out of the 240V system.. It wasn’t an expensive one, and gives out enough power to run the washer, and for several days, we didn’t start the engine at all as for hot water, we turned on the immersion with the generator running. There is still some fine tuning to do as the generator – whilst it can rev-up when more power is needed – is not fast enough when the washer demands power.. so occationally the washer stops and starts again.. but I should be able to turn down the battery charger that the generator also powers to a lower level to have more mains available when the washer needs it.. we will see.. more experiments to be done yet.. I have booked a week and a half off to enjoy the travelling and to remind myself why were on a boat 🙂 We left the mooring on a wonderful sunny day.. 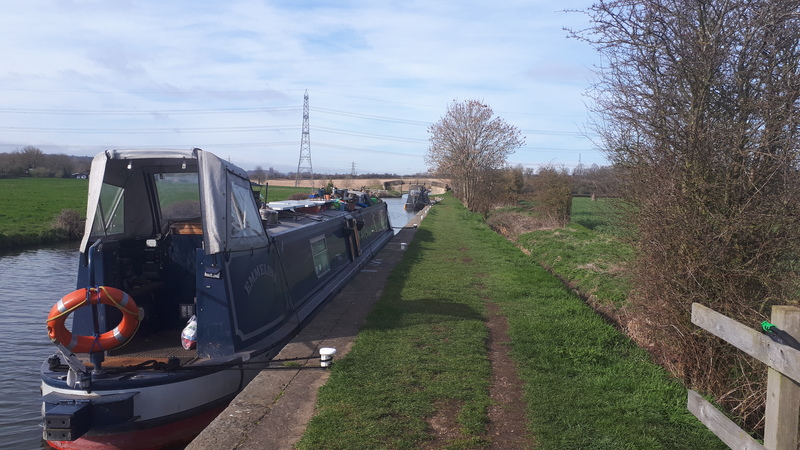 Even in March, there is still sun to be had.. and headed to Pilings Lock Marina (where we went a few weeks ago – and I went off with their diesel key, to swiftly walk it back to them the following day).. After sorting out the toilet tank – were good to move onto the Erewash canal. Up through Loughborough.. A few people stopping to see the rare sight of a boat moving ;).. through Bishop Meadow lock and into open country.. the flows starting to get stronger now, but the boat still loves being on a river.. 5mph with little engine revs.. feels like the Thames once more..